Preble Shawnee’s Calvin Leeth scrambles to pick up a loose ball during the Arrows game with Madison on Friday, Jan. 11. Shawnee lost the match up of the SWBL Buckeye Division’s top two teams, 80-51. 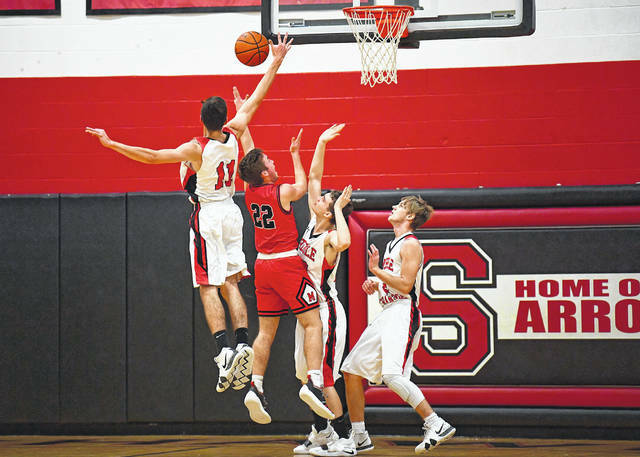 CAMDEN — Playing in front of a packed house Preble Shawnee’s boys basketball team had a chance to move into a first-place tie in the Southwestern Buckeye League Buckeye Division with a win over visiting Middletown Madison on Friday, Jan. 11. 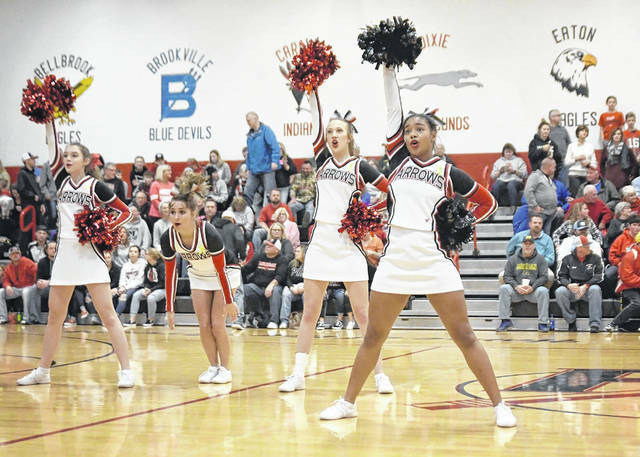 But the visiting Mohawks ended any drama by outscoring the Arrows 50-23 over the second and third quarters and prevailed 80-51. The loss was the second in league play for Shawnee, which fell to 4-2 in the division and 6-5 overall. Madison improved to 6-0 in the division and 11-1 overall. 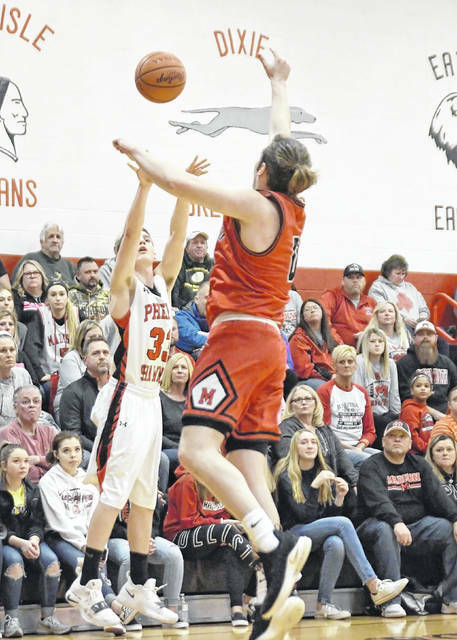 The Arrows were 20-of-56 from the field and committed 16 turnovers, while Madison made good on 47 percent (32-of-68) of its shots and only turned the ball over nine times. Shawnee was led by sophomore Bryce Singleton, who scored a game-high 19 points. He also had four rebounds, three assists and three steals. He was the only Shawnee player to score in double figures. Junior Jake Green tossed in eight point and grabbed three rebounds. Senior Cole Haney chipped in with six point and eight rebounds. Senior J.J. Hatmaker contributed five points and three rebounds. Senior Jedd Geisen added six rebounds. Madison was led by Grant Whisman, who scored 18 points. Jake Munafo had 14 and Matt Gomia contributed 10. 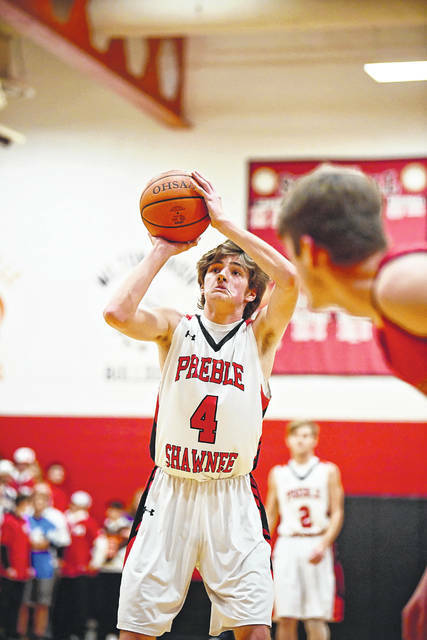 Shawnee was scheduled to host Waynesville on Tuesday, Jan. 15. The Arrows will make a trip to Dixie on Friday and will host Tri-County North on Saturday. 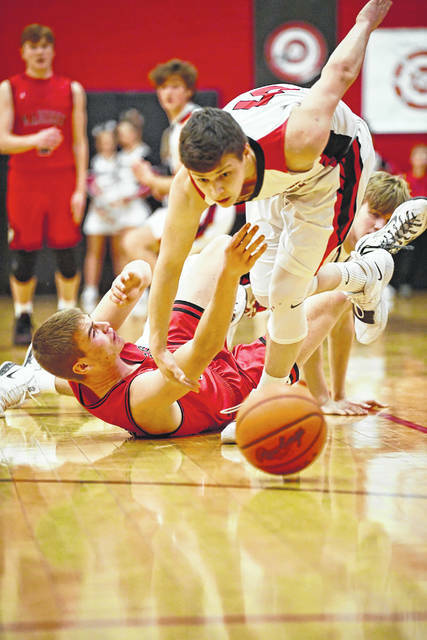 https://www.registerherald.com/wp-content/uploads/sites/41/2019/01/web1_psbbk1.jpgPreble Shawnee’s Calvin Leeth scrambles to pick up a loose ball during the Arrows game with Madison on Friday, Jan. 11. Shawnee lost the match up of the SWBL Buckeye Division’s top two teams, 80-51.